In 1885, at age 19, he graduated from the Parma Conservatory as a cellist, and joined an opera company for a tour of South America. When in Rio de Janeiro, the incompetence of the Brazilian conductor engaged for the tour so incensed the Italian singers and players that he was forced to resign, and the 20-year-old cellist was asked to take the baton for Verdi's AÏDA. By the end of the tour he had led 26 performances of 11 operas, all from memory. Between 1887 and 1895, Toscanini conducted in many Italian opera houses, and in 1896 became the principal conductor of Turin's Regio Opera House, leading the first Italian performances of Wagner's GÖTTERDÄMMERUNG, TRISTAN AND ISOLDE and DIE WALKÜRE, and the première of Puccini's LA BOHÈME, as well as a series of highly successful orchestral concerts. He was the principal conductor at La Scala, Milan, from 1900 to 1908, and first appeared at New York's Metropolitan Opera in 1915, where he conducted the première of Puccini's LA FANCIULLA DEL WEST. In the same year he made his début in the U.S. as a symphonic conductor. Recalled to La Scala in 1919, he reformed the orchestra and took it on a triumphant tour of the U.S., conducting 67 concerts in 77 days, followed by an Italian tour in which he led 38 concerts in 56 days. From 1926-1927, he was a guest conductor with the New York Philharmonic Orchestra, and in 1929 left La Scala to become its permanent conductor, a post he filled until 1939. 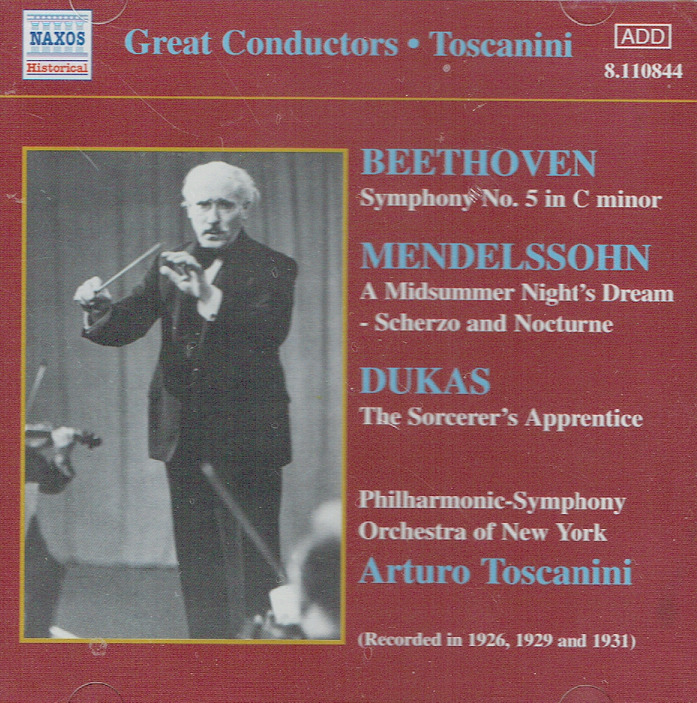 In 1937 Toscanini was invited by NBC to conduct broadcast concerts in America with a new symphony orchestra specifically created for the purpose. He then toured with that orchestra to South America in 1940 and throughout the United States in 1950. He also conducted a memorable series of concerts with the BBC Symphony Orchestra in London between 1935 and 1939. Toscanini's opposition to Fascism and Nazism was implacable. In 1931, he was attacked for refusing to play the ‘Giovanezza’, a Fascist anthem. In the same year he was the first non-German conductor to appear at the Wagner Festspielhaus in Bayreuth, but refused to return in 1933 in protest of the Nazi's treatment of Jewish musicians. He also turned his back on the Salzburg Festival because the Jewish conductor Bruno Walter's performances there were not broadcast in Germany. In 1938-1939, he conducted without fee at a festival in Lucerne, Switzerland, where the orchestra was composed entirely of musicians who had fled German persecution. Toscanini's conducting style featured a precise, vigorous beat and vivid body-language, which orchestras understood and responded to with dramatic results. By the end of his career he had memorized 250 symphonic works, and over 100 operas. Though he enthusiastically embraced post-Romantic, twentieth century music, he virtually ignored the Second Viennese School and the new breed of American composers that were making their mark by the 1950s. It was not false modesty, but genuine humility that led him to say in an interview ‘I am no genius. I have created nothing. I play the music of other men. I am just a musician’."